This book offers a new interpretation of Heidegger's major work, Being and Time. 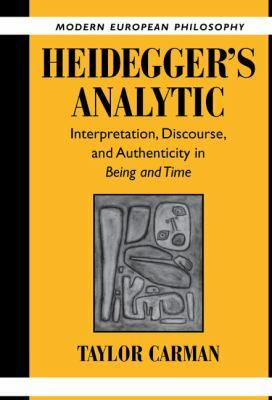 Carman argues that Heidegger is best understood as a realist & includes an interpretation explicitly orientated within a Kantian framework & an analysis of Dasein in relation to recent theories of intentionality. Robert B. Pippin is the Evelyn Stefansson Nef Distinguished Service Professor in the John U. Nef Committee on Social Thought, the Department of Philosophy, and the College at the University of Chicago. He is the author or editor of many books.